There’s a scene in the classic comedy I’m Alan Partridge where the chat show host meets the director of the BBC to pitch for a second series. When he gets turned down, he becomes desperate, reeling off random TV show ideas in the hope that something will stick. What’s funny about this, almost twenty years on, is that many of these bizarre ideas wouldn’t seem out of place on TV today. A few years back there was a show called Addicts Symphony where drug addicts performed a classic music concert – that’s right out of Alan Partridge’s notebook. Even Youth Hostelling with Chris Eubank was turned into this TV ad. What’s more, there’s actually something in Partridge’s technique of TV show invention. It’s very similar to what the Dada and Surrealist art movements were trying in the early 20th Century. In an attempt to shrug off mainstream logical thinking – which they believed was leading us into war – they embraced randomness and chaos, using a cut and paste technique to slam seemingly unconnected ideas together. And perhaps one of the most famous is Salvador Dali’s Lobster Telephone (1936). But great business ideas can also come from the surreal juxtaposition of seemingly unrelated concepts. The WTF Factor is vital in today’s cluttered, noisy world where it’s difficult to stand out. A lobster telephone in the 1930s was truly shocking to those who saw it – a lobster telephone in 2016 would barely get noticed on Instagram. It makes it really tough to stand out and grab attention these days. Which is why Partridge’s random TV show generation technique could be just what you need to come up with something interesting and different. 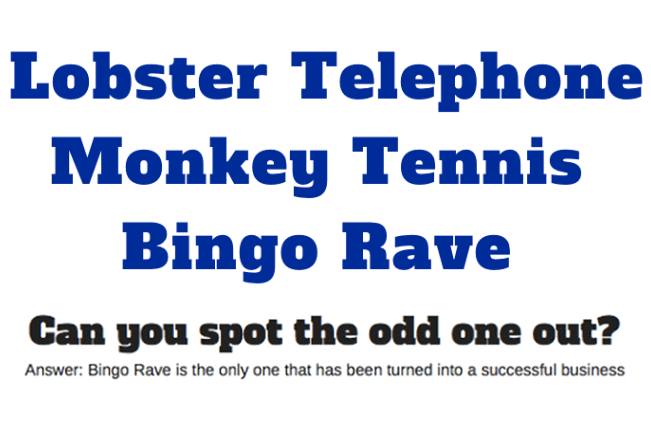 Bingo… raves… two very different things, right? Well check out Rebel Bingo. It began as a strange underground rave night in London but has since become so successful it has spread around the globe, with events in the U.S.A, Brazil, Spain, Portugal and China. The creators, Freddie Sorensen and James Gordon are from Norfolk (Alan Partridge’s county!). This is how they came up with the idea. Now I’m not advocating that you get drunk to come up with your next great email subject line, sales headline or product idea…. The thing about alcohol is that it lowers your inhibitions, pulling down those mental barriers that tell you something is “impossible”, letting more random and chaotic ideas pour out. Find a quiet space when you’re in a good mood. Okay, so once you’re loosened up and ready to go, decide on what project you’re going to use this technique on. Subject Lines – come up with something that jolts, perplexes, shocks or leaps out of the inbox and demands a response. Headlines – break cliché and say something that none of your rival businesses are saying – really stop that prospect in their tracks and make them read. 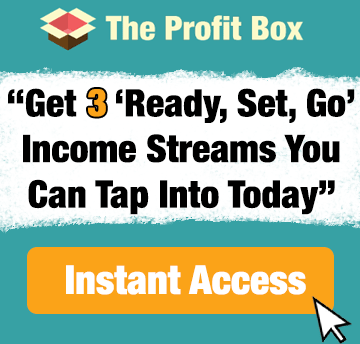 Social media posts – your Tweets, Facebook updates and other posts will stand out from cluttered newsfeeds, showing that you’re an original thinker, a sure-fire way to grow a following. Blog post headlines – people are more likely to share a post with a unique, funny or bizarre headline (this is how much of clickbait works) – what’s more, that headline will then appear on social media feeds, getting more shares. Product ideas – the holy grail of any business is to come up with something new and interesting that people haven’t seen before. It’s not easy, but this technique will give you a flood of ideas – all you need is for ONE to have legs. This was how Bingo Rave began! Design and layout – the way you present your products, emails, website and services could look radically different to everyone else’s. If you run an accountancy website and everybody else is using blues and reds, what about PINK? Once you’ve decided, write down a bunch of keywords related to your business or the topic of your email, blog post or social media update. Beer, organic, craft ale, pub, homebrew, saving money, hops…. Now take a magazine, newspaper or book and randomly circle a whole bunch of words (or cut them out). Don’t think about it too much or worry about the results. Next, go through the random words (if you cut them out, then shake them in a bag and pick them out) and match them with some of the keywords you’ve written down. Any of these could become your next subject line. Obviously you’re going to get many ludicrous results but some will surprise you. And remember, ludicrous might be just what gets your email noticed! This technique was pioneered by one of my great literary heroes William S Burroughs (and artist Brion Gysin) – be warned, it’s pretty way out stuff, buthere’s a short video explaining the origins if you are interested. Or if you’re simply looking to generate ideas for a new business, book or product, then I’d recommend getting a publication, book or article related to your field of interest. For instance if you’re looking to create a new fitness product get a fitness magazine, or if you’re a gardening blogger then get a gardening publication. Now get a totally unrelated publication from a different field of interest altogether (an article or printed-out blog post would do). Cut out or circle random words from both sources, shuffle them and start placing them together. And here is Bowie with one he mad earlier as seen in this excerpt from the excellent BBC Omnibus documentary called Cracked Actor from 1974. That’s how Bowie wrote his legendary songs, but really whatever method you use is fine. Nothing is True – Everything Is Permitted!